It’s official! Harvest has arrived. Today is the most important day of the year here at Benziger Family Estate, and not just because today is Mike Benziger’s birthday (Happy Birthday, Mike). Harvest has officially begun on our estate! It’s relatively early this year, which we expected as all phases of grape growth were earlier than usual. According to Mike, what we didn’t expect was for the crop to be so large. 2012 and 2013 were both record vintages as it relates to the size of the crop so we expected 2014 to be the year that the vines finally got tired and produced less fruit. Not so. 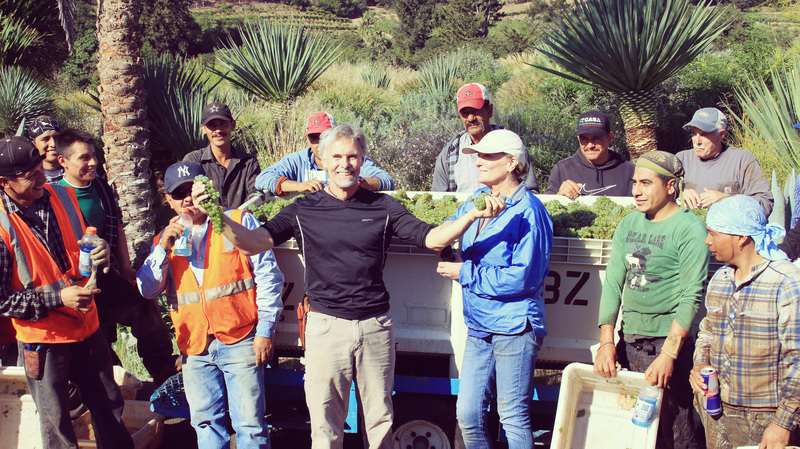 This morning we picked nearly 10 tons of our estate Sauvignon Blanc, Paradiso de Maria, which is the same amount that we picked in ’12 and ’13. Prior to those years, we would pick an average of 6-7 tons of Sauvignon Blanc off our estate. 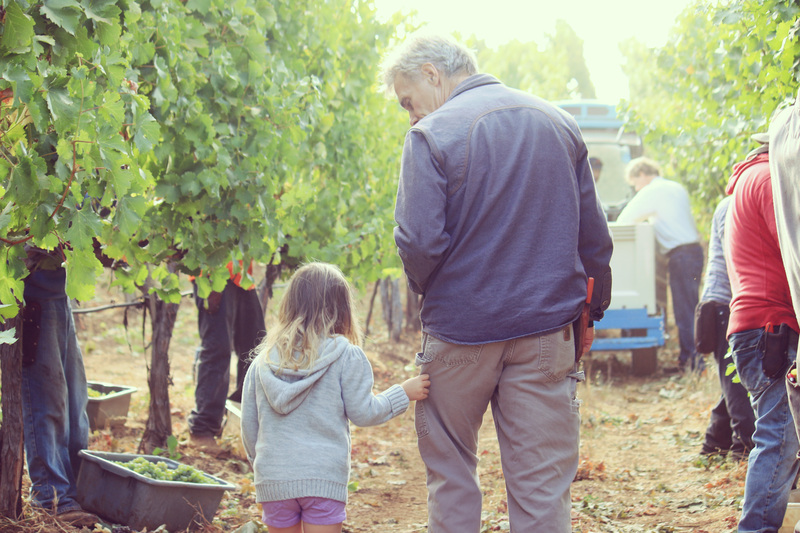 The first day of harvest is a family affair, we always pick the Paradiso de Maria first as it is the most early-ripening varietal on our home ranch. It’s also quite fitting as the wine was named for Mary Benziger, Mike Benziger’s wife. Of course, she always comes to ride on the bin and help. Various other Benzigers, even some of the youngest ones, also attend to kick off this important season and lend support to our hard-working vineyard crew. As anyone who is involved in the wine business will tell you, harvest is an incredibly stressful, exciting and fulfilling time. All year, our Viticulture and Winemaking crew watch the weather, evaluate the state of the vintage and help direct our hardworking Vineyard Managers on how to best care for the vines. 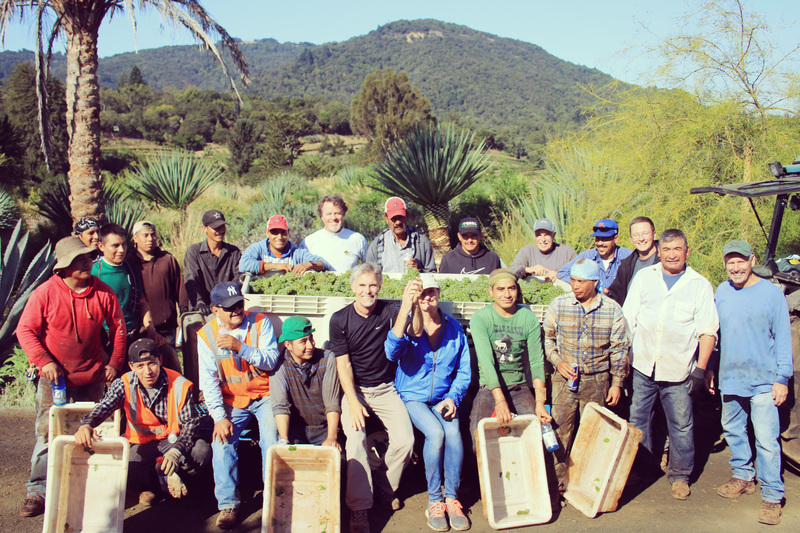 While it’s easy to get caught up in our day-to-day tasks of hosting our guests, bottling, giving tours and pouring wine, we are all aware that the grapes really are the most important part of our business. Their health is vitally important to our ability to create great wines that our guests and members will love. In short, for many of us, harvest is the culmination of a year’s work and we are all invested in making sure it is a successful vintage. This harvest is also unique in that all the fruit is expected to get ripe around the same time, so we are looking at a condensed harvest, maybe as short as 6 weeks. This will most likely make for a stressful year as we will have to divide crews, attention and equipment in the field as well as in the winery. When all the grapes come in at the same time, we have to rely on our Production Manager, Andrea Card to use her logistical genius to make sure there are tanks, barrels and staff enough to get the fruit and juice in to the winery all at the same time. It also means we’ll have some tired, sore and stressed vineyard crew around the property, but we know they will do a great job. They always do. Although we are expecting that 2014 will be a crazy, short harvest season, we are also feeling excited about the crop. The grapes look beautiful and healthy despite this year’s devastating drought. We hope you’ll come out and visit us some time during harvest, it is truly the best time to visit a winery. There is an energy in the air that is rarely felt at any other time of year. There is also lots of winemaking activity to witness, big purple grapes waiting to be picked and the smell of fermenting fruit in the air. It’s our favorite time of year, and we love sharing it with you. Tagged benziger, Benziger Family Winery, family, grape growing, grape photographs, harvest, Sauvignon Blanc, wine, wine country, Wine TastingBookmark the permalink. Congratulations to the Benziger Family Winery for 30 years of hard work creating a lovely legacy! Picking 10 tons of grapes sounds like the Happiest Birthday present Mikey could ask for. Hope all the grapes are bountiful, especially the Chardonnay! Thank you for this update. Happy the earthquake did not do too much damage to the land we all love. Thanks, Kathy. We promise to take extra special care of that Chardonnay! It’s a beautiful day and we are thankful to be spending it picking our grapes rather than picking up broken glass and busted barrels. Cheers! Happy Birthday to Mike and congrats to the entire family. I cant wait to taste this years vintage! Thank you Wade! We’ll pass on your birthday wishes to Mike!